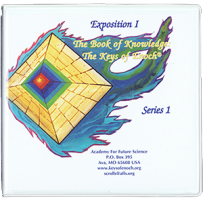 For those interested in deeper work with The Book of Knowledge: The Keys of Enoch®, the Exposition study series are an excellent introduction to the teachings of The Keys of Enoch®. These series are particularly of interest to those who are studying in groups, where the CDs can be played and then further discussion on the subject can follow. 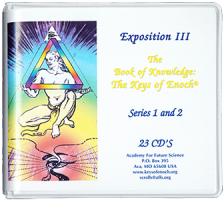 Please note that to benefit most from these CDs, it is recommended that you have a copy of The Book of Knowledge: The Keys of Enoch®. Exposition I: The Book of Knowledge: The Keys of Enoch® . A closer look at the predicted changes in biology, genetics, physics, and paraphysics in terms of a new consciousness cosmology. The lessons take you through each of the 54 keys of the book, chapter by chapter, encompassing specific examples of what will be needed in the use of spiritual and consciousness insights to face the toughest requirements, today and tomorrow, in a pluralistic world. Exposition II is available only as a complete set. A multi-faceted overview of the Keys of Enoch from the biblical texts showing “the first-fruits of Spirit” and the profound depths of the Holy Scriptures. The Holy Sephiroth is a 12-month study program explaining the Sephiroth, the ten distinct stages of Light according to the Kabbalistic Tree of Life from Malkuth (Kingdom) to Kether (Crown). This program of teaching will involve twelve study workbooks, one per month. The ten stages of the Sephiroth are designed to reveal the Attributes of the Divine, the Nature of the Universe, and the Garment of Light. The studies are based on the formative powers of the Divine Names knitted together with the new horizons of the scientific keys outlined from The Book of Knowledge: The Keys of Enoch® and the Biblical correlations of the teachings of the Masters of the Kingdom. The Sephirothic series in combination with the Keys offers an immense enrichment to our understanding of the revelation-tradition of the Living Word, particularly as it applies to the elevation of Light work throughout the world. The purpose of this study program is to emphasize the thought-forms of higher states of consciousness that can be applied to a wide scale of teaching, meditation and visualization techniques, so necessary for Light work on all levels. This series of teaching texts explains the mystery of the Kabbalistic Tree of Life as it brings together the evolution from the earthly Kingdom of Malkuth into the many Trees of Life through Divine Evolution into the many worlds of our Father’s House of Many Mansions. This series is recommended only after you have read The Book of Knowledge: The Keys of Enoch®. It is not an explanation of the book but an advanced teaching that goes with the book. (For an explanation of the Book of Knowledge, see the Exposition Study Series.) We welcome your active participation in this teaching series emphasizing both spiritual and scientific pathways for understanding the ‘Externalization of the Hierarchy’, the Keys of Enoch®, and the use of the Language of Divine Creation. Please let us know in your order details if you want them all at once, rather than the recommended 12 books 12 months program. Thank You. 6 months $75.00 + Shipping. You can always help • you can always pray.